We now have THREE accredited coaches in New Zealand, with more to follow soon I hope. Congratulations to Sue, Linda and Cathy! Scroll down for more information. The criteria for coaching updates are relaxed somewhat for coaches who live on the other side of the world! RWYM's most global citizen is Ashleigh Sanderson, who coaches mostly in Asia, but also South Africa ,Kenya, Germany, Italy and Spain. In Asia she coaches in Singapore, Kuala Lumpar, Bali and Thailand. Both Mary Wanless and Anna Gordon-Redmond have taught in South Africa. More recently British Coach Suzanne Marshall has held clinics there. Ashleigh Sanderson also coaches there. Mary-Ann and Jenny have created a thriving community of learners in the Jo'burg area. 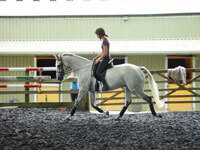 Jenny has coached some of their International Para Riders, and has just upgraded to Level 2 Competence. We Brits all rellish the thought of returning there in future! Mary Wanless taught in Australia a number of times in the 1990s. 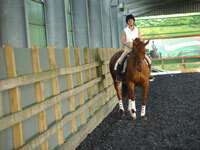 She has more recently been forging links with Andrew and Manuela McLean from the Australian Equine Behaviour Centre. She looks forward to returning to Australia at some stage. Congratulations to Lucy Williams BHSI who has recently achieved Level 1 at Mastery and Level 2 at Competence. Congratulations to Sue as she joins Linda and Cathy, giving us three accredited coaches in New Zealand! Anne Mongomery from Perth, Australia, also holds regular clinics there. (See above) Mary finally got there in December 2016, and looks forward to going again soon! CONTACT THE RWYM OFFICE AT rwymadmin@hotmail.co.uk or +44 1993 831193 if you are serious about putting together a clinic in your part of the world!